Adams v Torre – A Sham? Below is one of the most famous and brilliant games in chess history, but is it genuine? 18 Qg4 Qb5 19 Qc4 Qd7 20 Qc7 Qb5 21 a4 Qxa4 22 Re4 Qb5 23 Qxb7 Resigns. No-one, to our knowledge, has suggested that Torre was using the word ‘study’ in the sense of ‘composition’, i.e. to drop a hint that the game was spurious. Nor do we possess any record of the score having been published anywhere until the Bulletin gave it, after a five-year gap. Now we turn to Adams himself. Who was he and what was his connection with Torre? “My chess career”, Mr Adams modestly wrote us many moons ago, “consists principally of my interest in Carlos. I commenced to study the game about ten years ago. I had a hard time of it, as I had to batter my way along and get whatever pointers I could pick up by watching the others play, and finally I learned the code and played over the games in the books. It was over two months before I was able to win a game from the poorest player I could find at the club (and the only one who would play with me), and it was only by “bucking the line” and being “thrown for many losses” and taking my medicine like a man that I finally learned to play a little. About eight years ago I met Carlos. I think he was then about 14 years old. He was a small, dark-skinned, thin little fellow, very polite, quiet and serious for a boy of his age. He had learned to play chess from his father and brothers and soon was able to make short work of them over the chessboard. Dr Ainsley (now deceased) was their family physician, a member of the chess club and also a very good player, well above the average. When visiting the family one day they mentioned to him that they had a small member who could play a good game and asked him to play with the little chap and see if he really could play well. I think Carlos won two out of the three games to the surprise of all. Dr Ainsley then suggested that he play Mr Percy Moise, a very strong player. Carlos showed his strength with him also. Next, I think, he played with Mr C. Rosen, also one of the best here, with the same results. Things, however, drifted along until I received a letter from his older brother telling of Carlos’ chess ability, when I arranged to have him come to the club and show what he could do. 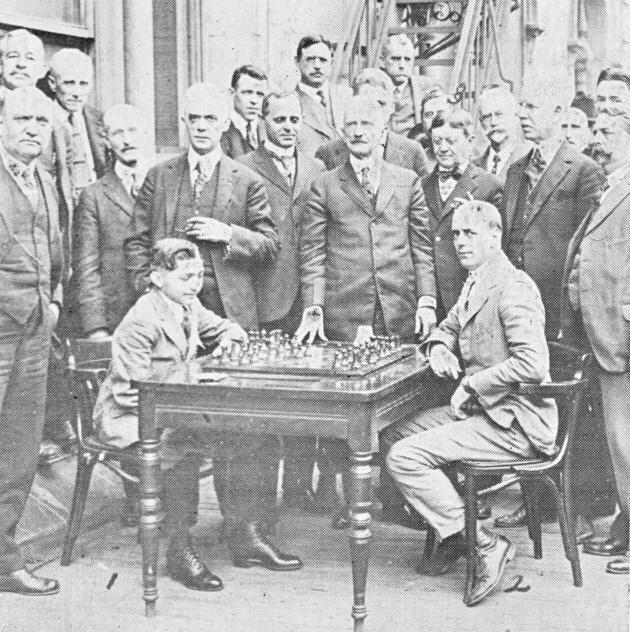 None of the old dignitaries with chess reputations wanted to play with the child, so a Dr Sternberg, a visitor, volunteered to play him. The latter had been toppling us all over, and that, I figured, would be a real test. I will never forget that day. As one of the gentlemen remarked, ‘You felt more like petting the little fellow than trying to beat him a game of chess’. Carlos electrified the crowd, and Dr Sternberg enjoyed his rout also. Next, Carlos gave a peripatetic exhibition, playing six games at once, winning four and drawing two. The chess club was so impressed with his play that they gave him carte blanche, and from that time on he visited the rooms very often, until he could not get anyone to play with him, for they were all tired of being beaten. So he had nothing to do but come to my home occasionally, when we would play a few games and go over the openings together. His next feat was to win the city championship in 1923, which he did with ease. I beg to acknowledge receipt of your interesting letter of 18 November and notice what you have to say in regard to everybody being wild about Rzeschewski and that nobody seems to be very much bothered about Capablanca at present. Such is life in a big city, as one new star appears the old one eventually becomes dim. Of course the match with Dr Lasker and Capablanca would be interesting and I would like to see it come off but as long as it [sic] a commercial proposition the only benefit it would give chess is to give it a few cut and dry games and probably a large number of them draws. It looks like these big fellows want to squeeze the apple for all that is in it. I have just received a visit from C. Torre, R., and I have obtained the following information from him. He was born in Merida, Yuc. Mex. 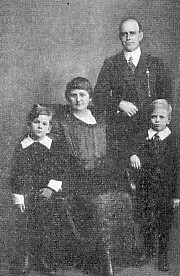 29 November 1904 and came with his parents to this country in 1916. He has been playing chess with his father and brothers for about six years and about two years with all comers. He learned the game from his father and brothers and became so efficient at it that he soon left them far behind. He has played the following with the strongest players to a finish in N.O. but I am sorry to say there is [sic] no records kept of the games. His simultaneous exhibition at the chessclub, he won eight and drew two games. In a lightning game with Mr E. Laker [sic] of Chicago played in April 1920 the game was given up as a draw. The little fellow is very modest and unassuming and his success in chess has not given him the swell head. He has a very extensive knowledge of the openings also the end games. He is also a very good problem solver. If he had some professionals to play with, I think in a short time he would be very strong. I am sending you herewith a copy of the only game that he could give me and hope you will find it of interest. 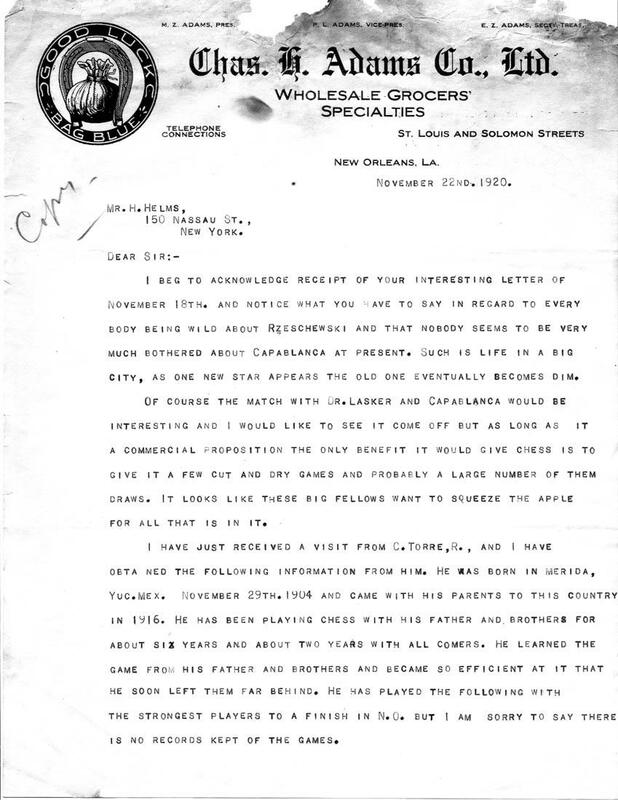 The two-page letter may be viewed here (page 1, page 2). 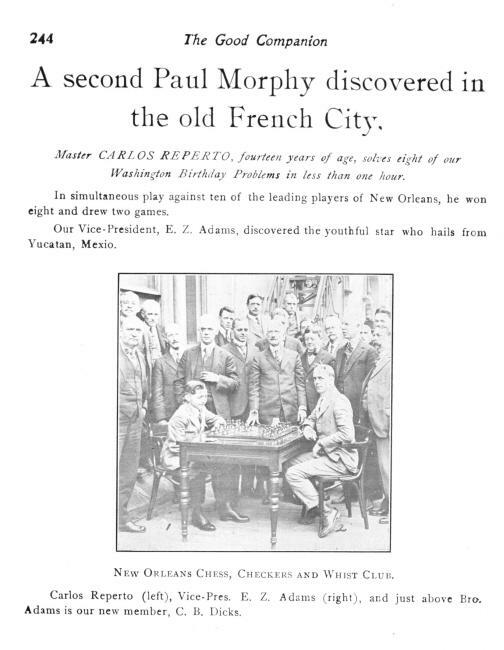 We have no information on a draw against ‘Mr E. Laker of Chicago’ in 1920, but page 203 of the December 1921 American Chess Bulletin gave a loss by the Mexican (‘played between Carlos Torres [sic], 16 years old, and Edward Lasker of Chicago during the latter’s visit to New Orleans during November’). ‘This letter is very significant because it drives the final nail in the coffin of one of the most famous games of all time, a game that simply never was. ... It seems obvious that the game could not have been played up to 22 November of that year without Adams mentioning it or sending it to Helms, so except for the faint possibility that it was played from 23 November to 31 December of 1920 – and then surely Adams would have sent it to Helms at that later date – there simply was no such remarkable game played until that time. When Torre sent the game to Helms in 1925, it was simply his reconstruction of the “game” including the post mortem analysis that comprised the beautiful final combination. 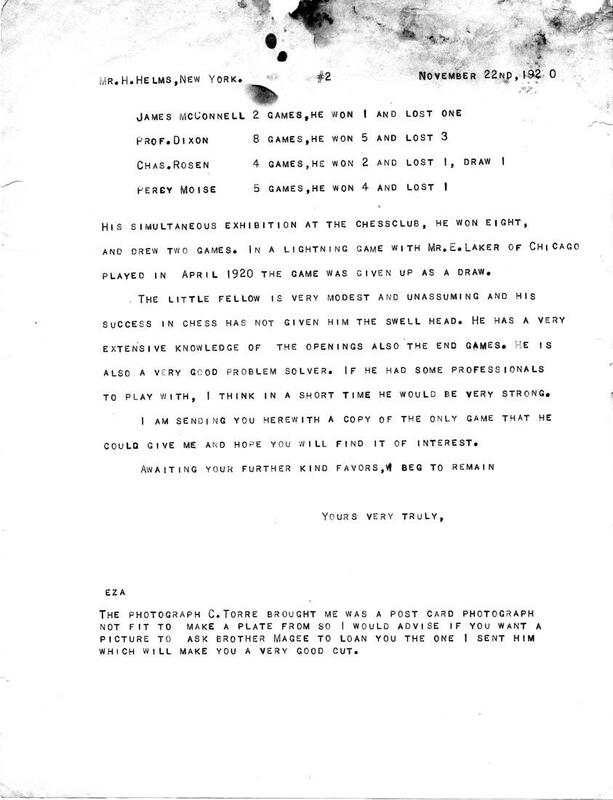 The game actually sent to Helms, referred to in this letter, could not have been the game since it was so sensational that Helms would have immediately published it. 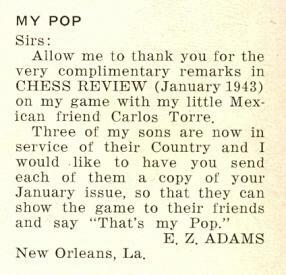 ‘Allow me to thank you for the very complimentary remarks in Chess Review (January 1943) on my game with my little Mexican friend Carlos Torre. Can it be ascertained what appeared in Adams’ column about Torre? Afterword: The above article is a digest of various C.N. items, as listed under ‘Adams v Torre’ in the Factfinder. Subsequent items are reproduced below. 1 e4 e6 2 d4 b6 3 f3 Bb7 4 Bd3 Qh4+ 5 g3 Qh5 6 Be3 Bd6 7 e5 Bxe5 8 dxe5 Qxe5 9 Kf2 Qxb2 10 Nd2 Nf6 11 h3 Nh5 12 Ne2 O-O 13 Bd4 Qa3 14 Nc4 Qe7 15 Qd2 d5 16 Ne5 c5 17 Be3 c4 18 Nxc4 dxc4 19 Bxc4 Qf6 20 Ng1 Qxa1 21 White resigns. 1 e4 e5 2 Nf3 Nc6 3 Bc4 Bc5 4 b4 Bxb4 5 c3 Ba5 6 d4 exd4 7 O-O Bb6 8 cxd4 d6 9 d5 Na5 10 Bb2 Nf6 11 Bd3 O-O 12 Nc3 Bg4 13 Kh1 Bd4 14 Qd2 Bb6 15 Ne2 c5 16 Ng3 c4 17 Bc2 Rc8 18 Nd4 c3 19 Bxc3 Nc4 20 Qc1 Ne5 21 Qb2 Qc7 22 Nb5 Qc5 23 Rac1 Nc4 24 Qb3 a6 25 Nd4 Ba5 26 Ndf5 Bxf5 27 Nxf5 Rc7 28 Bxf6 Qa3 29 Bxg7 Rfc8 30 Bf6 Qxb3 31 Bxb3 b5 32 Bxc4 resigns. 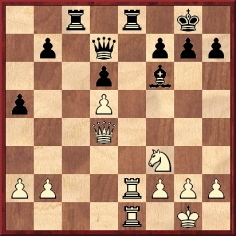 ‘Leaving aside the Torre v Adams (French Defense) game published by Chernev which appeared in your feature article, these are, to the best of my knowledge, the only known true games of E.Z. Adams published anywhere, and they are both true patzer games. As regards the famous “Adams v Torre” game, its first known publication came not from the winner but from the loser. 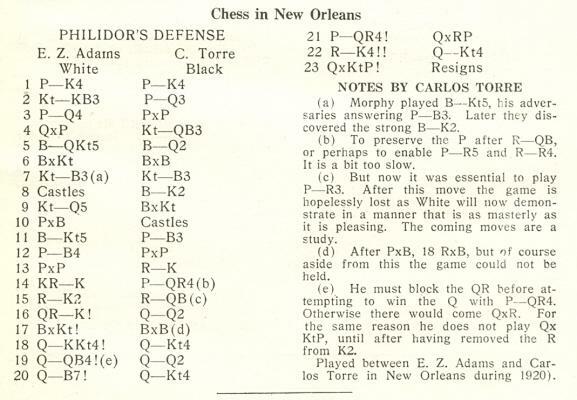 This alone must arouse suspicion, since it was well known that Torre owed his start in New Orleans chess to Adams. The fact that Adams appeared to certify the game’s origins in 1943 does not mean too much. That was about 23 years later, Adams was in likely poor health (he died a year later), and who was he to dispute a game which any master would be proud to claim as his own when the loser himself publicized the game? My view is that neither Torre nor Adams intended anything underhanded. Torre was later known to have said that who won the game was of no great importance and that it was the beauty of the idea that mattered. It is also a virtual certainty that in 1920 there was no tournament in New Orleans important enough to have Torre competing; in addition, it is extremely unlikely that any such tourney would have found Torre competing against players as weak as Adams. That essentially means that it had to be a skittles game. Most likely it was an analysis session where the interesting stem position came up and Torre pointed out the beautiful combination to Adams. Above all, there is the simple, direct statement on page 287 of the fine book on Torre by Gabriel Velasco which is quoted in your feature article: Torre’s friends Alejandro Báez and Pedro Busto Undiano stated that the game was never played but was an idea of Torre’s after analyzing a skittles game. In C.N. 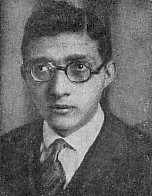 2571 (see above) a correspondent noted the difficulty in determining Irving Chernev’s source for a 21-move game – a French Defence – between C. Torre and E.Z. 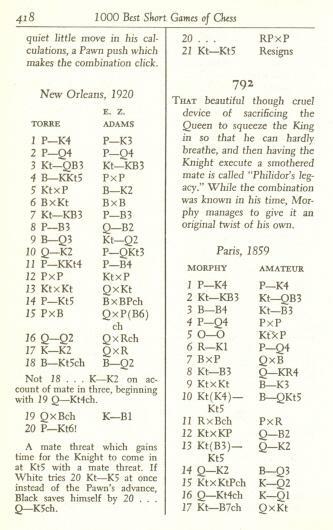 Adams (New Orleans, 1920) presented on page 418 of his book 1000 Best Short Games of Chess (New York, 1955). Where Reinfeld obtained the game was not specified. Regarding this game, your American correspondent [an anonymous person referred to on page 28 of the Autumn 1956 issue] mentioned “the Adams-Torre (or vice versa) game”. Let me clear up this affair. There is one of each. You will find the famous one (Adams-Torre) together with the less well-known, but interesting Torre-Adams in the British Chess Magazine for 1926 on pages 249 and 250. 1) When Torre v Adams (French Defence) and Adams v Torre (Philidor’s Defence) were published on pages 249-250 of the May 1926 BCM they had the heading ‘Two games played at New Orelans in 1920. Notes by J.H.B. [Joseph Henry Blake]’ Only the latter game had been published in the American Chess Bulletin (November 1925, page 157), and Blake’s source for the French Defence game is currently unknown to us. 2) Chernev’s reference to Les Cahiers de l’Echiquier Français in connection with the Adams v Torre brilliancy is of interest. The French magazine (see the illustration above) did not mention Torre’s notes or give any date, merely indicating that the game had recently been appearing in print. 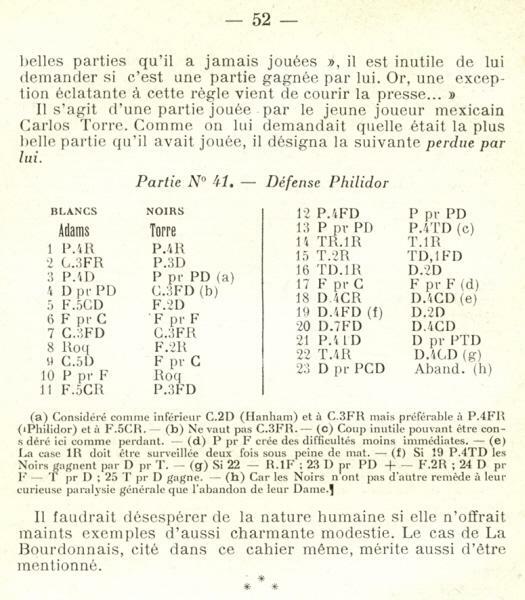 Moreover, since the game was in the second cahier, whereas even the fourth one was still dated 1925, the French magazine apparently gave the game well before it appeared in the November 1925 American Chess Bulletin. But where did it obtain the game and, in particular, what was its source for the statement that Torre considered that loss his most beautiful game? Calling Torre a master at the time the game was purportedly played is hard to justify. Latest update: 30 September 2015.